MAVROMATIC | Page 144 | Your source for home automation, home theaters, product reviews, mods, hacks, DIY projects, electronics or anything else I'm into at the moment. Do you have a repetitive one button task you want automated? Well, Michael Simpson over at Kronos Robotics shows you how to build a keyboard button pushing robot. I've used their DIOS line of microprocessors and if you want to build anything from a remote control transmitter to an automated cat feeder for a low cost... Kronos Robotics is the place to check out. Russound has announced an affordable XM Satellite Radio option for their high performance modular tuner. When used in a Multi-Room system, the convenience, extensive choice of programming and near cd quality sound can be available from anywhere in the home, at the touch of a button. The folks over at Russound have also announced an innovative server that stores and manages music and digital images providing easy retrieval from virtually anywhere in the home via their CAV6.6 Audio/Video Controller/Amplifier. WOW! I got a chance to demo the most amazing home theater enhancement since 5.1 surround sound. It's called the Odyssee by D-BOX. Simply amazing... here's a quote from their website, "By lifting your seating and occupants on a four-point suspension, in perfect synchronization with the onscreen action and sound, Odyssee creates a virtual reality experience in your living room or home theater. You’re drawn into the action as never before as you experience the same motional forces as the actors and players you’re watching. The emotional effects and spine-tingling excitement created by Odyssee are breathtaking, exhilirating and just plain fun!" The system adds a tactile experience like no other, because this uses acuators that travel 1" at 2 G's you actually feel like you are part of the movie. Be sure to read up on this company and technology... and if your budget allows, definately drop the $23k on the full system. Who says you need to be a studio excutive to afford reclining home theater seating? Acoustic Innovations has released affordable entry level theater seating that actually looks good. You won't get cheap over stuffed looking designs here. Instead, the BridgePointe is a "club chair" design that can fit more seating in a smaller space. It has been designed from the ground up for theater viewing, unlike other reclining cinema seating which are just repurposed recliners with cup holders. What is a home automation system without a 15" inwall LCD touchscreen? Exactly! I don't understand why a raw touchscreen monitor without the base and plastic costs more than a standard 15" LCD monitor? Solution, take a 15" LCD touchscreen monitor bought off of ebay and turn it into a custom inwall touchscreen... 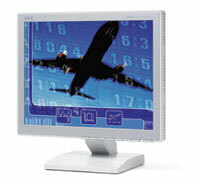 I choose a 15" NEC 1560v+ with integrated touchscreen because the viewing angles on NEC LCD displays are excellent. The screen will act as a digital picture frame when not in use and will also have built-in microphone and speakers via a 1 watt Canakit CK122. 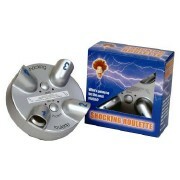 I was watching TechTV's Fresh Gear and they showed this little gadget called, "Shocking Roulette". It was hilarious! So I went to ebay and bought it for $20 shipped. When I opened the box as to what I thought was a "toy", printed in multiple places was "THIS IS NOT A TOY! ", now that's pretty sketchy. I still brought it in to work, but everytime I try it on someone new, I need to ask these two questions, "Do you have a pacemaker?" and "Do you suffer from Epilepsy?". This is a pretty fun "toy", the anticipation is what gets you... the shock feels about a 9v battery to the tongue.